FIIs were net buyers of equity on Tue. (Jan 15), but net sellers on Mon. & Wed. (Jan 14 & 16). Their total net selling was worth Rs 6.6 Billion. DIIs were net buyers on all three trading days. Their total net buying was worth Rs 12.5 Billion, as per provisional figures. India’s wholesale and retail inflation eased further in Dec ’18 on the back of cooling food and fuel prices. CPI-based inflation slipped to an 18 months low of 2.19% from 2.33% in Nov ’18 and 5.21% in Dec ’17. WPI-based inflation was at an 8 months low of 3.8% against 4.64% in Nov ’18 and 3.58% in Dec ’17. A vicious battle for supremacy is raging on the daily bar chart pattern of Nifty, with no quarter given and none asked. On Mon. 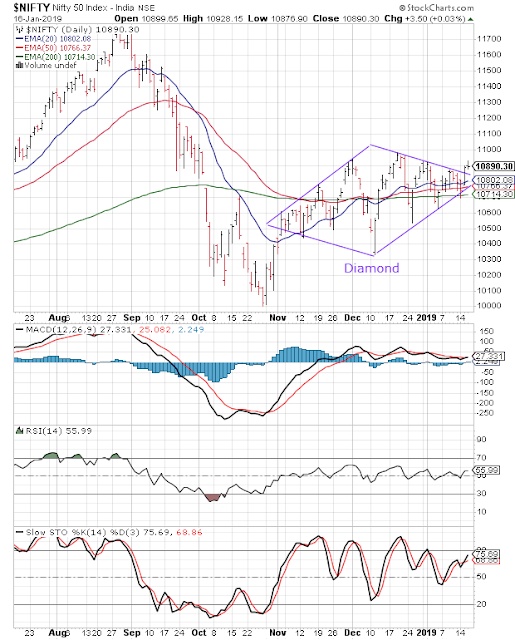 Jan 14, the index dropped below the ‘diamond’ pattern – within which it has been trading since the beginning of Nov ’18 – and even slipped below its 200 day EMA into bear territory intra-day. Just when it looked like bears were going to dominate, bulls bought the intra-day dip and ensured that the index closed just within the ‘diamond’. On Tue. Jan 15, the index broke out and closed above the ‘diamond’ pattern on the back of combined FII and DII buying. However, the breakout has not been a convincing one. Volumes (not shown) were not significantly higher to technically confirm the upward breakout. 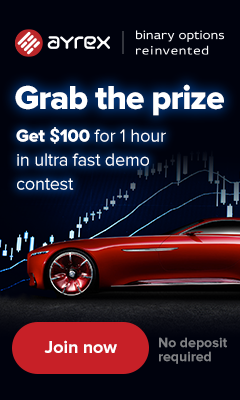 Today’s lacklustre trading and formation of a small ‘shooting star’ candlestick pattern is an indication that bulls were unable to drive home their advantage. Nifty is trading above its three EMAs in bull territory. A convincing index close above the previous (Dec 19th) top of 10985 is necessary if bulls are to regain control of the chart. Daily technical indicators are in bullish zones, but not showing much upward momentum. MACD is moving sideways after merging with its signal line. RSI is above its 50% level. Slow stochastic is rising towards its overbought zone. Nifty’s TTM P/E has moved up to 26.17 – which is much higher than its long-term average in overbought zone. The breadth indicator NSE TRIN (not shown) is oscillating in neutral zone – hinting at some near-term consolidation. Q3 (Dec ’18) results declared so far have been a mixed bag. Upcoming results of Reliance, HUL, ITC can give some impetus to bulls. But oil’s price is inching up and the Rupee is slipping against the US Dollar. So, the probability of a sustained bull rally appears low.